With a newborn at home it is rather challenging to make meals. 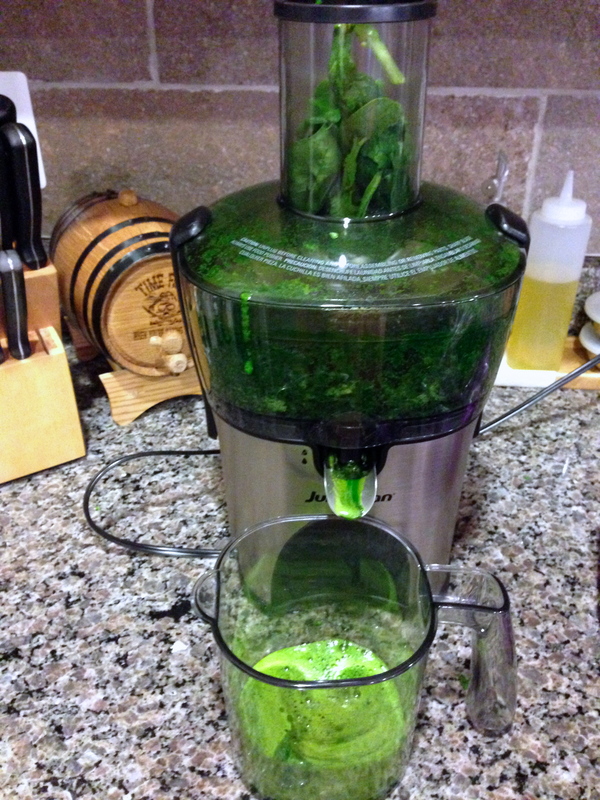 I am all about making something quickly, hoping it is as nutritious as can be and gobbling it down in light speed. I wanted to share with you two of my new go to meals/sides. 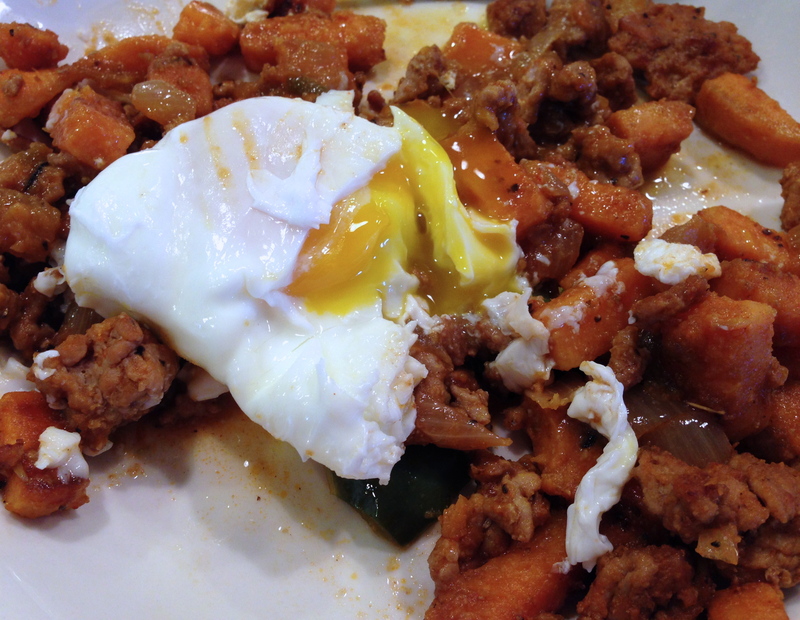 The first one is an easy sweet potato mash. I simply wash sweet potatoes (I usually make 4 medium size), poke holes in them with a fork, place them in the microwave for 20 minutes (or until soft), peel the skin, mash the sweet potatoes in a bowl with a fork, add 1 tbsp of butter for each sweet potato I bake, whip it all up with the fork and ENJOY! 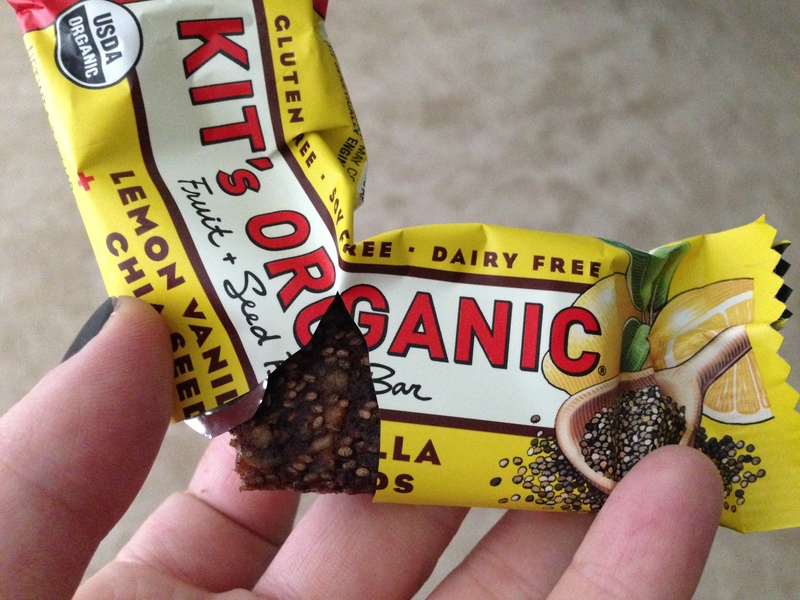 An easy side that leaves me so satisfied I do not crave dessert, #winning! Next up is a breakfast dish! First you chop bell peppers [You can use any color, I had a 3 pack – red, orange, and yellow – from Costco, so each day I got to choose a new color!] . The second step is similar to the first; slice tomatoes [I bought a variety pack from Costco of mini tomatoes ranging in color from dark red to red to yellow.] Next, I sauteed the peppers in olive oil (lightly coat the pan) for 5-10 min (until starting to slightly turn golden on the outside) on medium heat. Then, I added in the tomatoes and continued to cook until the bell peppers were soft and the tomatoes had a “stewed” appearance. 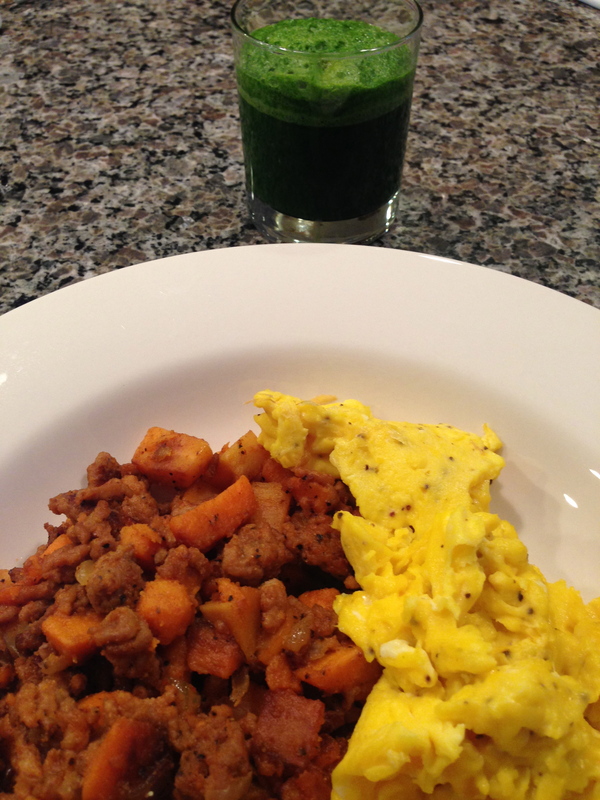 After the veggies were cooked I added in about 1/3 a carton of Kirkland (Costco brand) egg whites. I cooked until the egg whites were finished. Finally, I poured out a mini 100 cal guacamole pack (purchased at Costco) on the side to use as a dipping sauce! Below are pictures of the egg white containers & the mini guac packs… great purchases when you go for a Costco haul!!! Hopefully you can find the above food on your plate in the morning!! 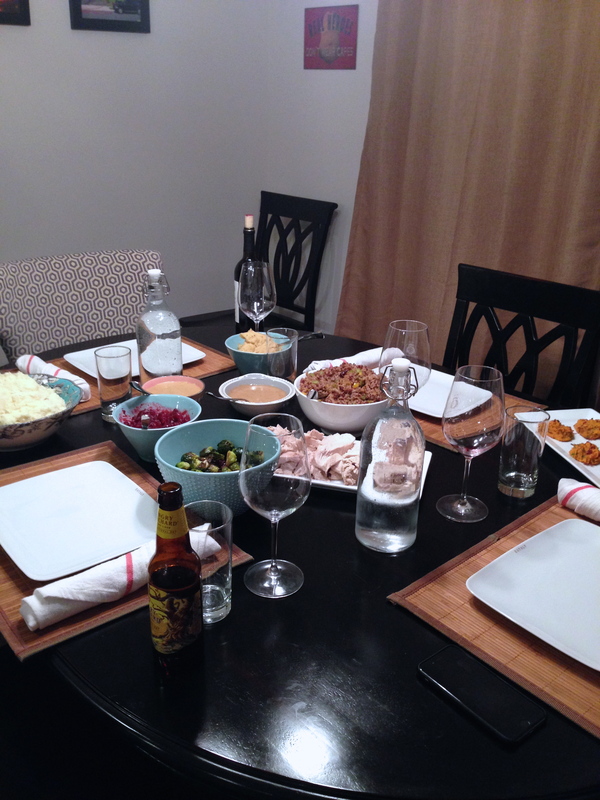 On Saturday my husband and I prepared our first thanksgiving dinner for our friends. We were pleased with the turn out! The following foods in a wonderful atmosphere were enjoyed…. The napkins are actually dish towels from IKEA – a little secret, all restaurants use these to add to their “farm to table – rustic” look. 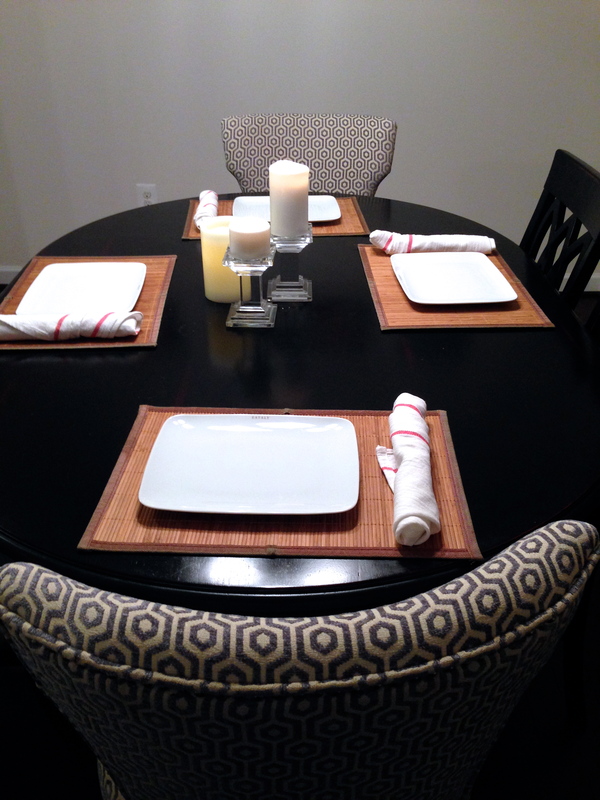 I cut off the inside label and the hanging string, ironed them and my husband rolled up the silverware! 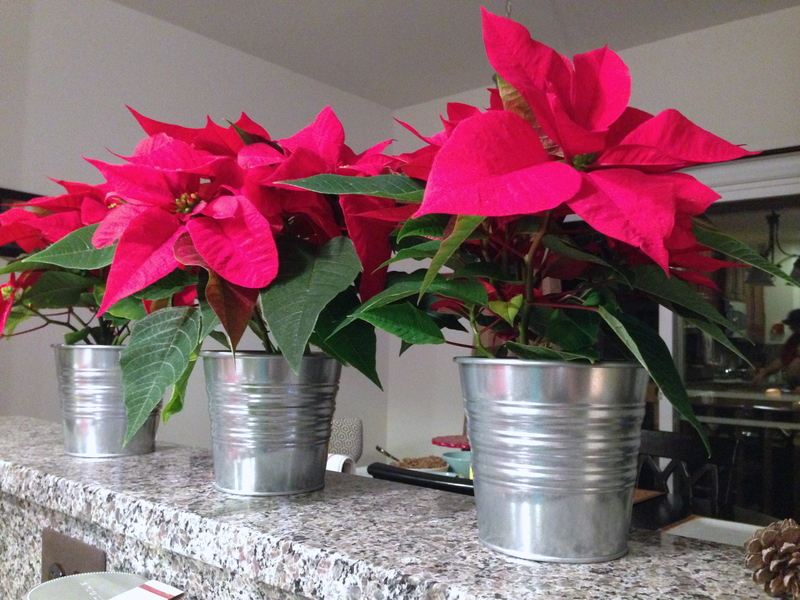 The poinsettias are from Wegman’s and were repotted in these awesome tin cans from IKEA. We had a fun time at IKEA the day after thanksgiving to do some non-sale shopping. 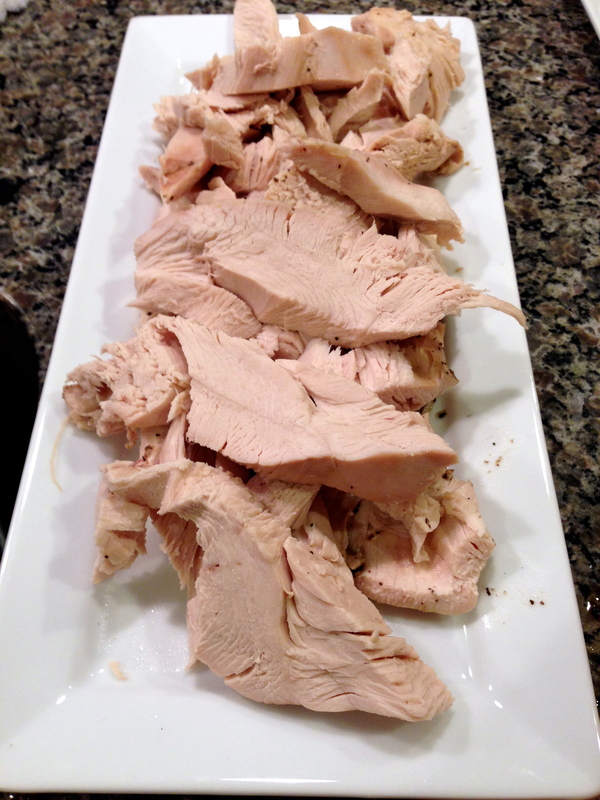 The turkey was purchased from Wegman’s – nothing fancy just a basic turkey that took forever to defrost! 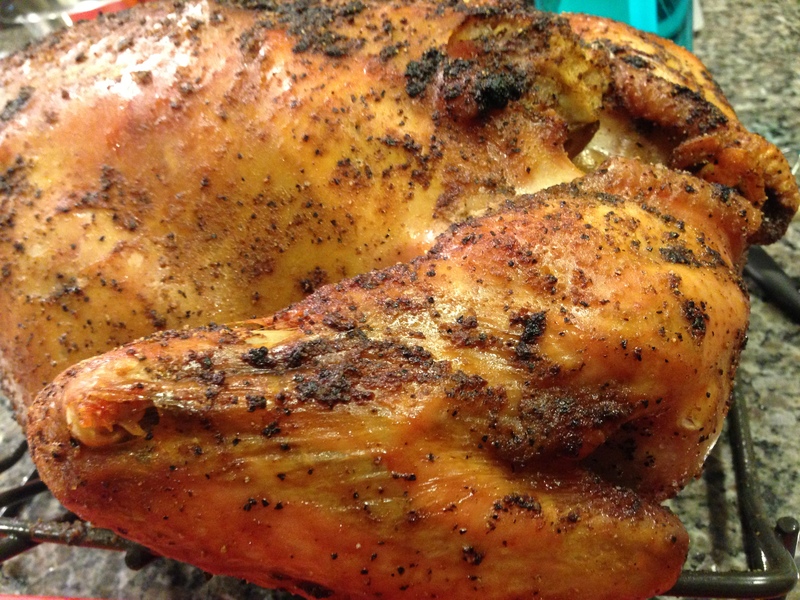 We seasoned it with salt, pepper and garlic powder. 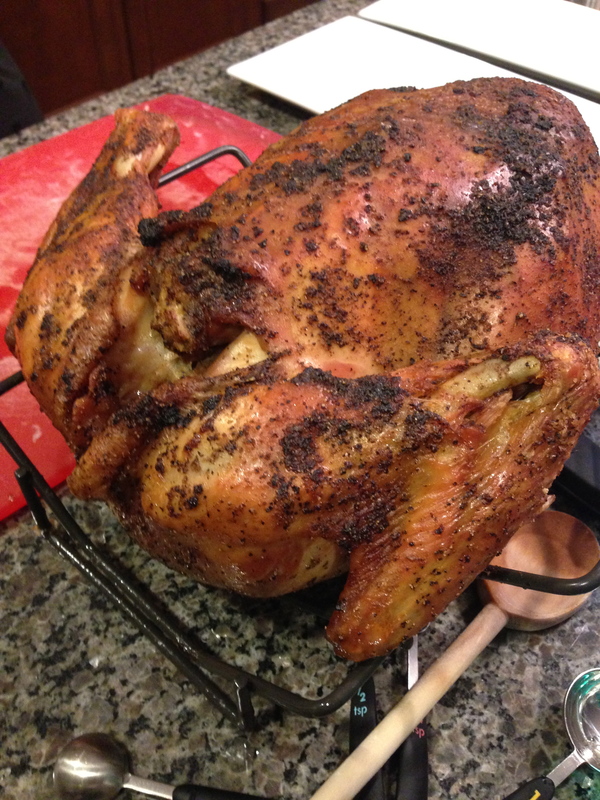 The turkey was extremely moist (sorry that’s the only word that properly describes the food) with delicious flavor! 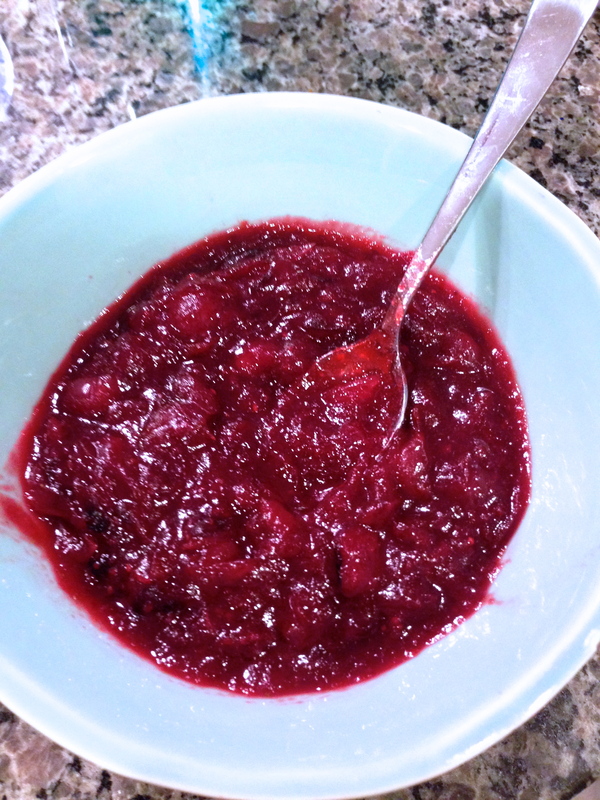 Cranberry Sauce: I mixed one 12oz bag of cranberries, 3/4 cup water, 1/2 cup honey and a few tbsps of coconut palm sugar to taste (see under Vittles section which product I keep in my cabinet). I cooked this mixture for about 25 minutes to ensure all the water had been absorbed, the cranberries had popped and the sauce was adequately thick. The sauce was a little tart, however, my taste buds prefer this flavor as I “believe” it is more natural and less man-made. 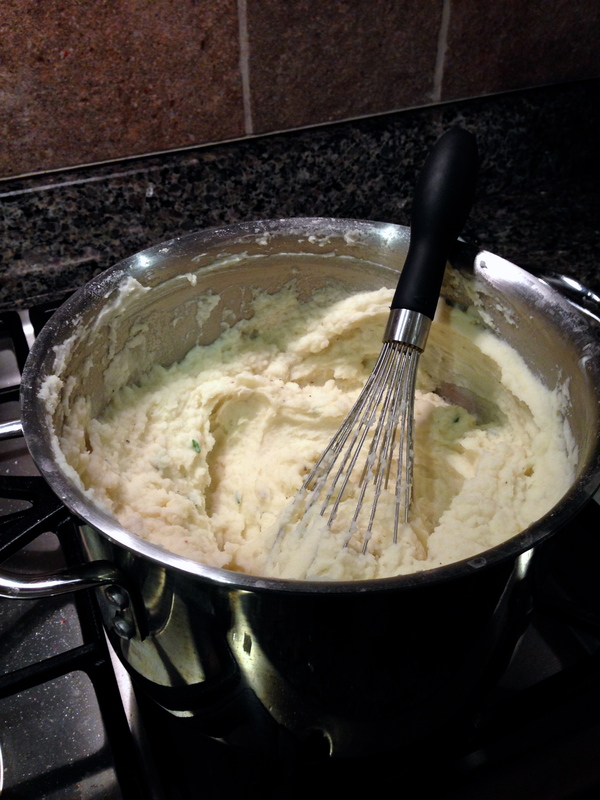 Mashed…turnips & parnsips for me and potatoes for the others. 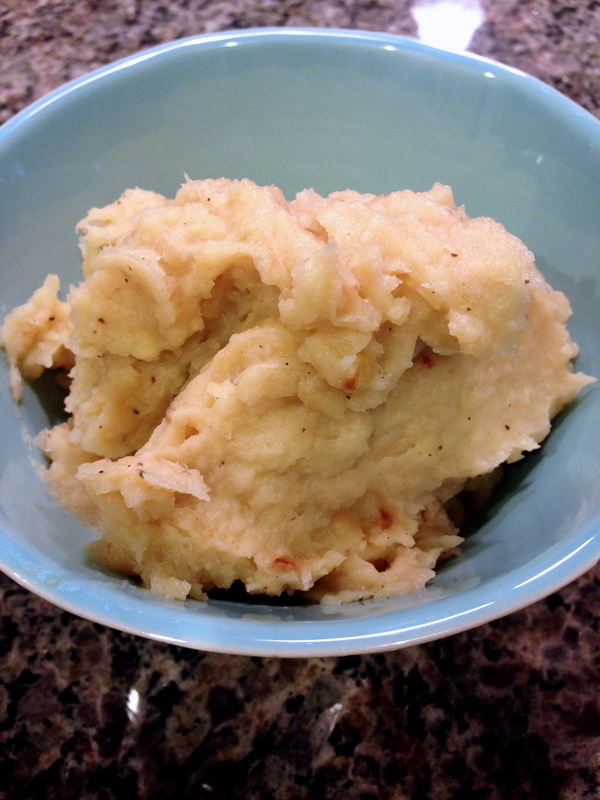 I used this recipe for my paleo side dish: mashed turnips and parsnips from Primal Palate. Very basic ingredients and simple instructions, I used half an onion, instead of the full for a sweeter lighter taste… ENJOY! The texture was thick lite and fluffy; I think I will use this recipe for our little one’s baby food!! 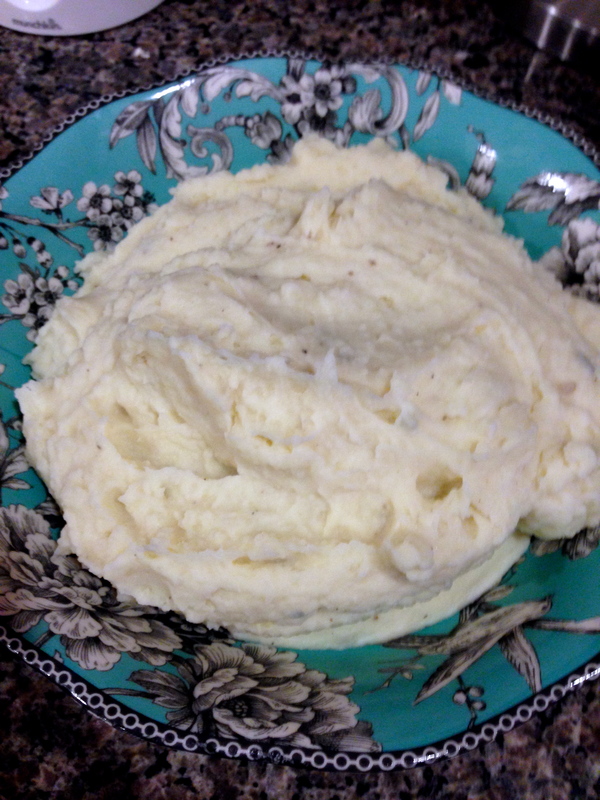 Pictured below: paleo mash is featured first, followed by the potatoes being mashed & the final product. 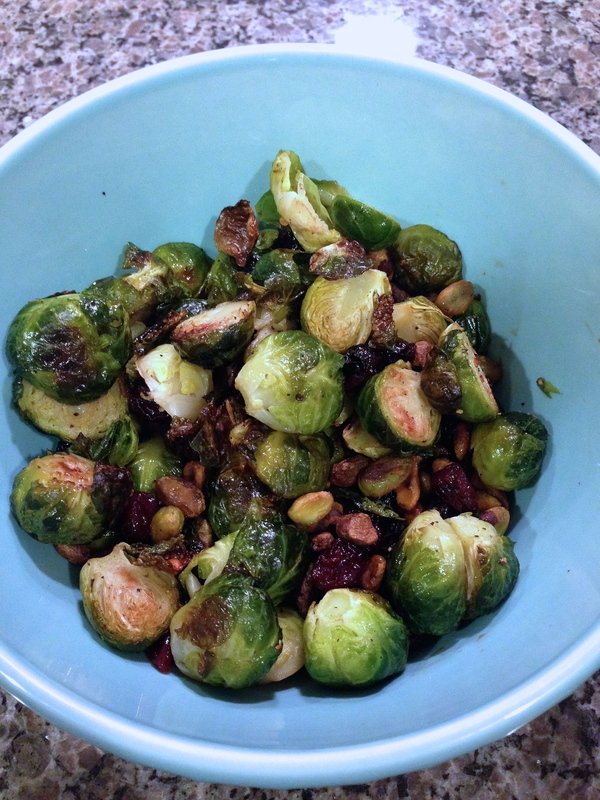 Brussel Sprouts: we dolled these bland veggies up. They were seasoned with salt, pepper & olive oil and baked with dried cherries & pistachios, They were enjoyed by all, even those who don’t normally eat this vegetable…SUCCESS!! 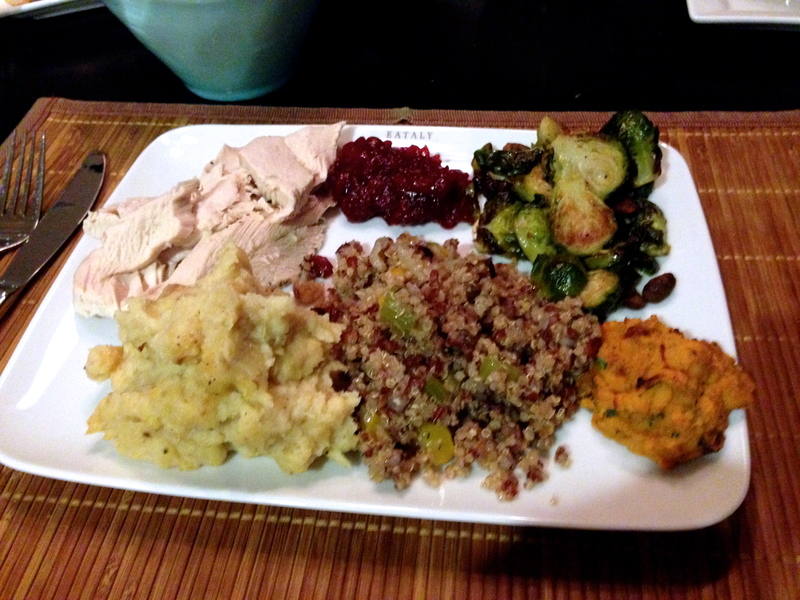 Stuffing… quinoa & red rice Williams Sonoma mix. 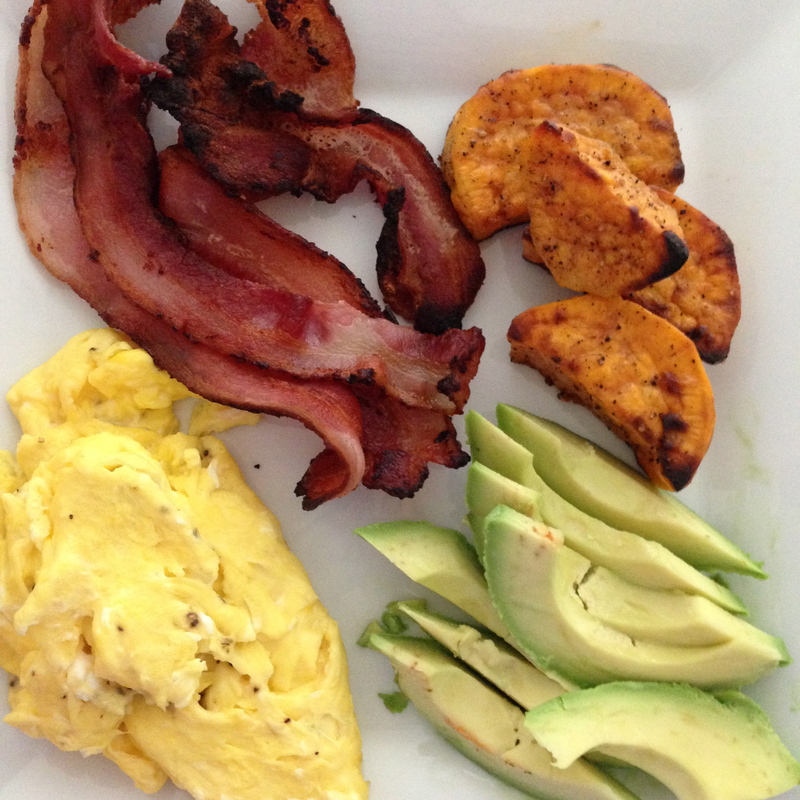 To make this treat more paleo friendly, I did not use butter – substituted with olive oil. Additionally, I used half an onion, a full yellow pepper and the zest of half a lemon to add additional flavor. 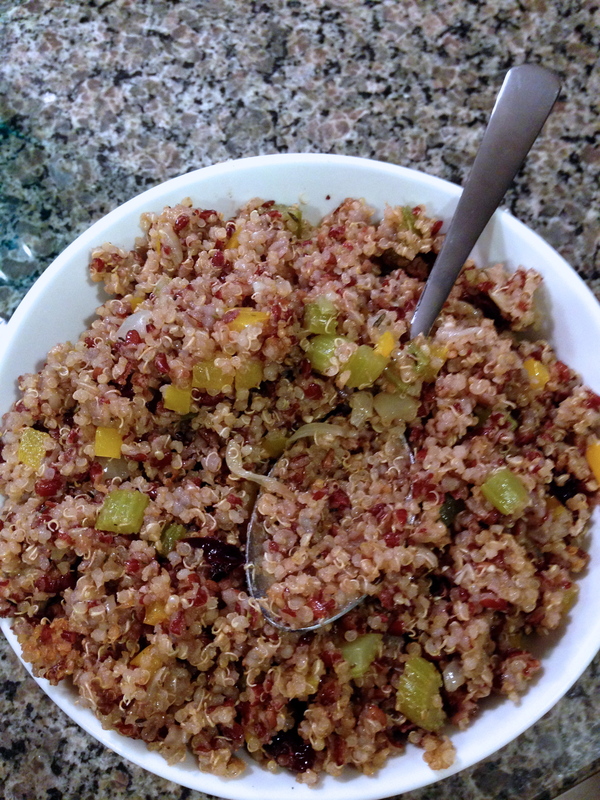 Not a paleo dish as these are super food grains, however, you gotta splurge every now and then! Biscuits: No bread!!! 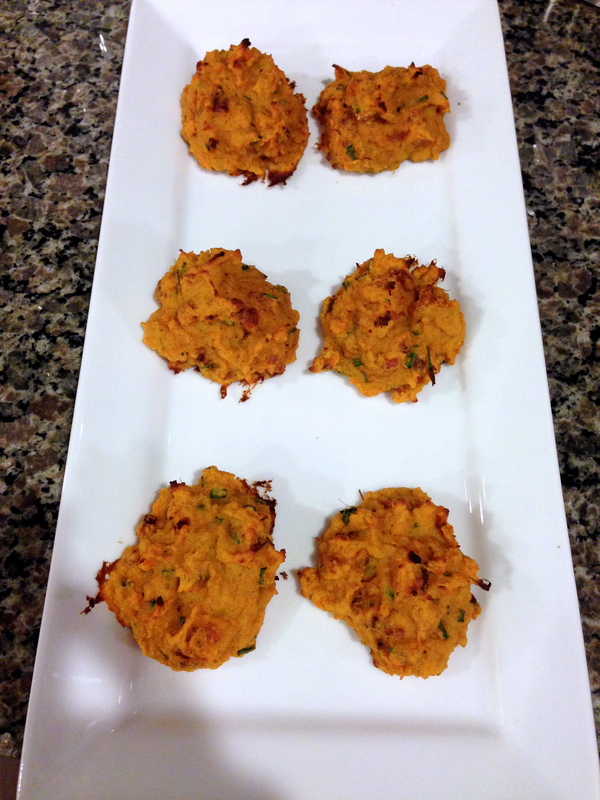 We made the famous Bacon and Chive Sweet Potato Biscuits from PaleOMG. We had made these last year and fell in love with them, after being pregnant and eating GF CARBSSS I hadn’t made them since. We forgot how good these biscuits are and will be making them again this weekend just to have around during the week! 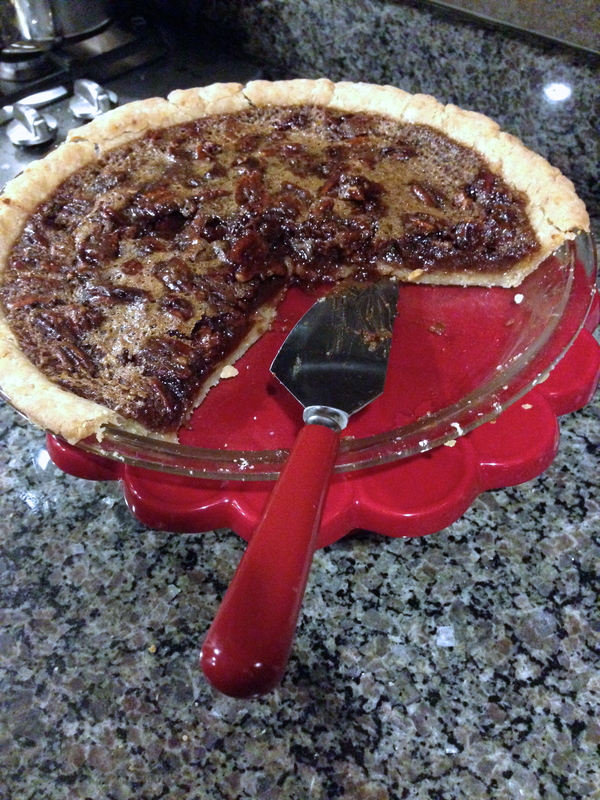 Pecan Pie: You just have to have some dessert!! 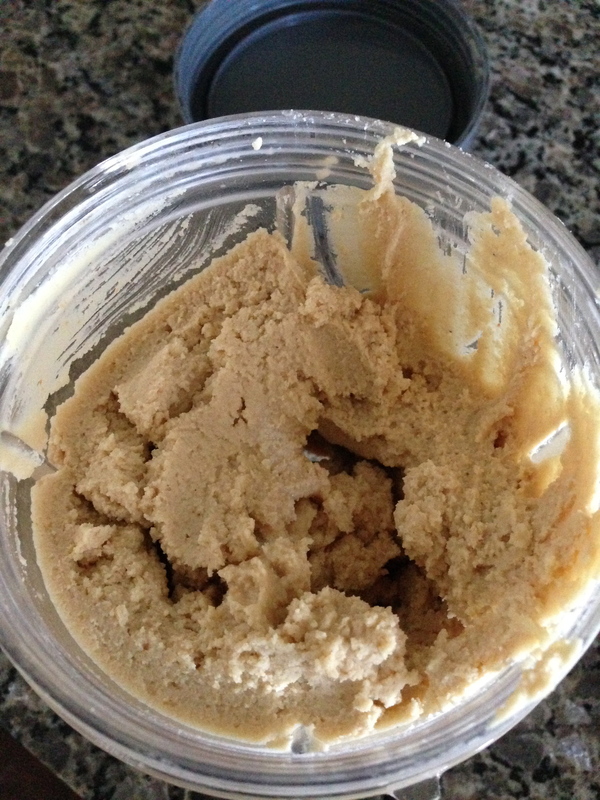 I made Gluten-Free Pie Crust by following the recipe from Living Without Gluten Free’s online recipes. I used Cup4Cup flour, coconut oil and coconut palm sugar and followed the rest of the recipe as stated! The filling, I cheated, I used Williams Sonoma’s Chocolate Pecan Pie filling which is sold in a glass jar and is absolutely divine!!! Note: the coconut ingredients gave the crust an additional unexpected coconut flavor, which paired with the chocolate pecan filling very nicely! Last but not least, you must sit down and feast!!!!! I hope everyone had a wonderful holiday!!! My goal for this week… EXERCISE EVERYDAY!!!! you can drink your wine and eat it too! 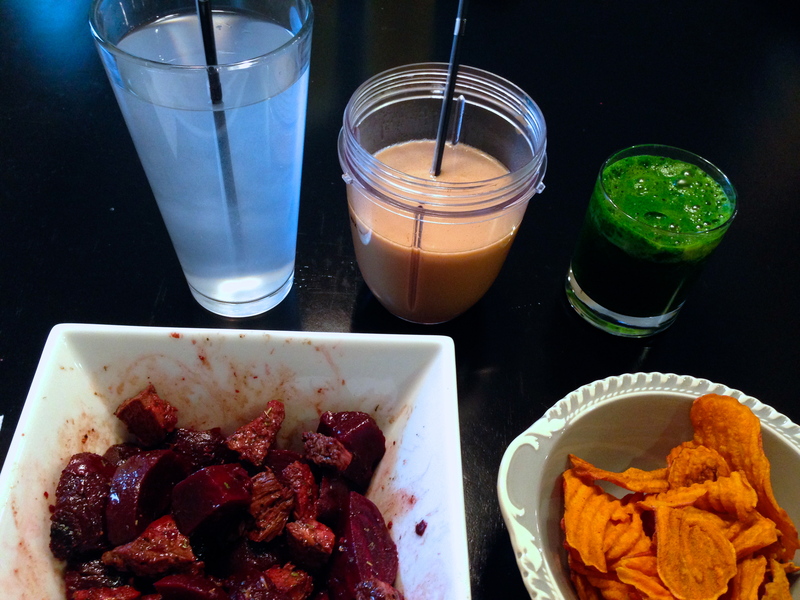 photographed: coconut water (home-made, check out the “hydration” tab above to see which brand I mix into water); bulletproof coffee remix (i use Nespresso vanilla pods with 1 tbsp of coconut oil mixed in a Nutribullet); green juice (apple + spinach juice made in the Juiceman appliance); beet & steak chopped salad (seasoned with herbs de provence, avocado oil & balsamic vinegar) and Terra sweet potato chips (MY NEW OBSESSION!!!). Now it is time to burn off these calories!!! Hope everyone is staying warm and having a pleasant friday night! Made by my wonderful husband (I will have to work on getting the secret recipe ;p ). 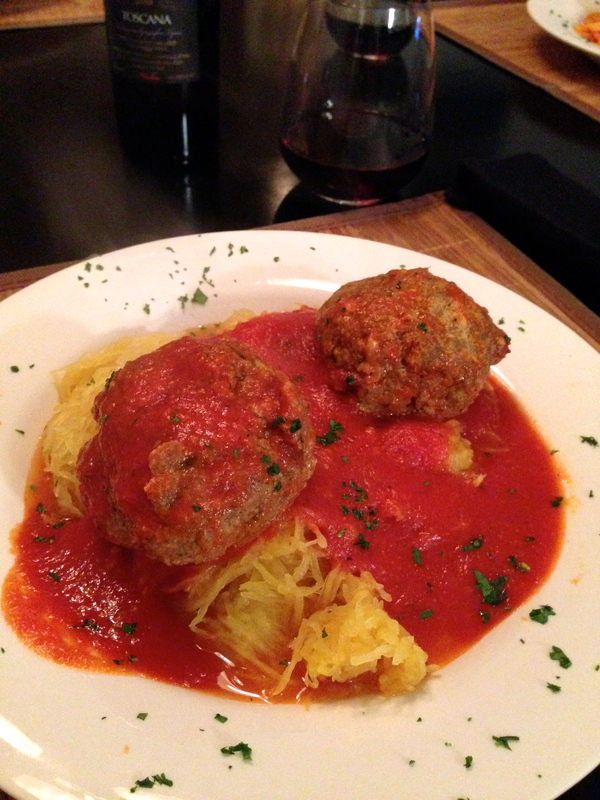 These meatballs are a modification of Frankie Spuntino’s Meatballs (click on link for recipe) – we omitted cheese. Guilty, we used gluten-free bread, next batch I would like to omit that ingredient as well. Thankfully my husband bares with my diet restrictions and kindly adjusts the recipe for himself and I. The tomato sauce is simply whole canned tomatoes strained and cooked on medium heat until thick consistency meets your liking. Refer back to squash post for preparation for spaghetti replacement: spaghetti squash (click on link for cooking instructions). Dinner: sausage with bacon & apple cider vinegar kale and parsnip fries. 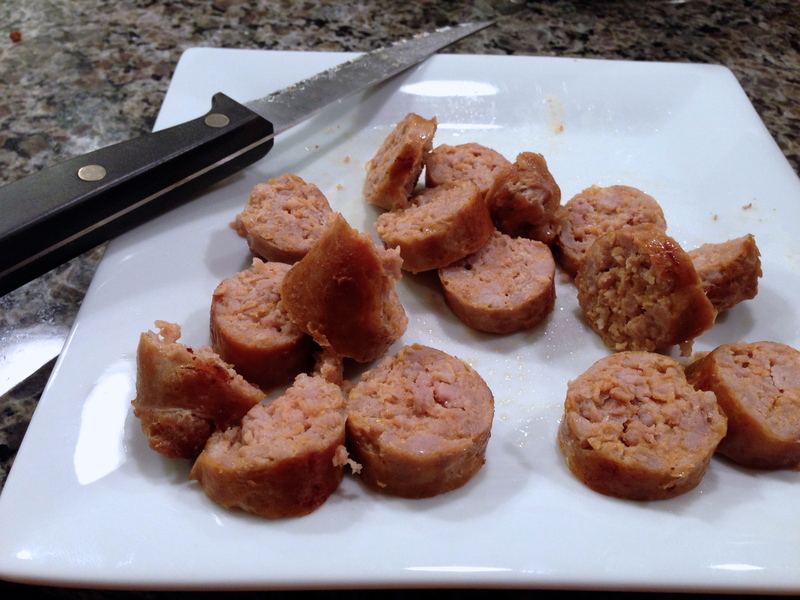 This mild italian sausage was purchased from Wegman’s (their own brand), no additives. 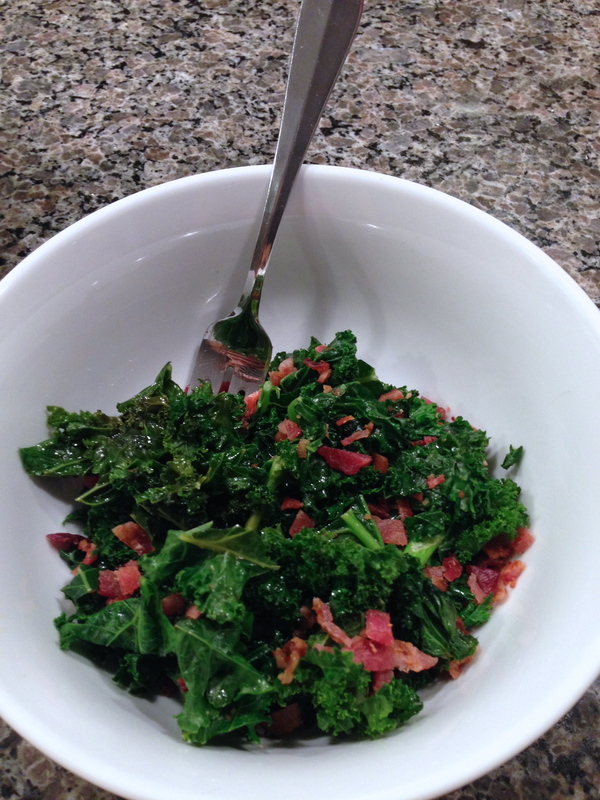 The kale was sauteed in bacon grease and topped off with finely chopped bacon of two pieces and apple cider vinegar (add until your taste buds appreciate the flavor, I used about 4 tbsp on my serving). My husband made parsnip fries again, twice fried in avocado oil. 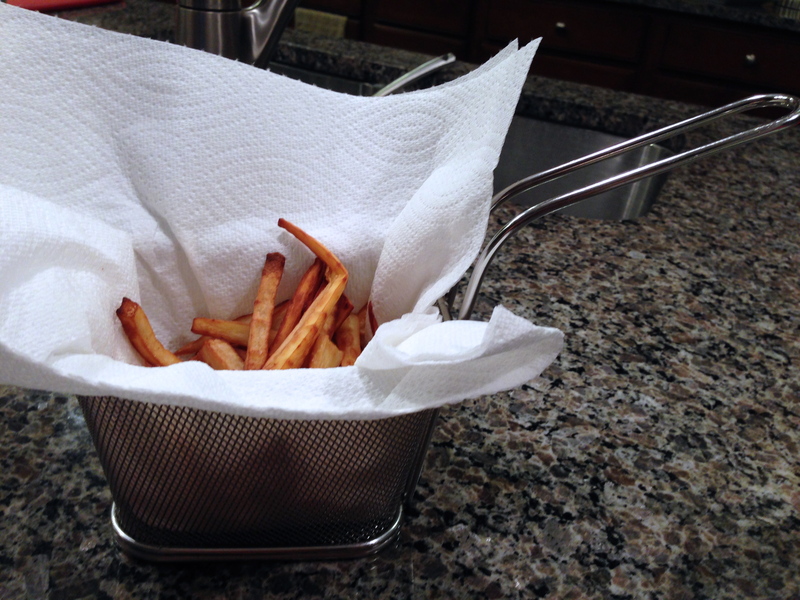 This round he made the slices a bit thicker – I thoroughly enjoyed the “meatier” fry compared to the thinner crispy fries. However, I do have to say both are excellent and I highly recommend making this side. 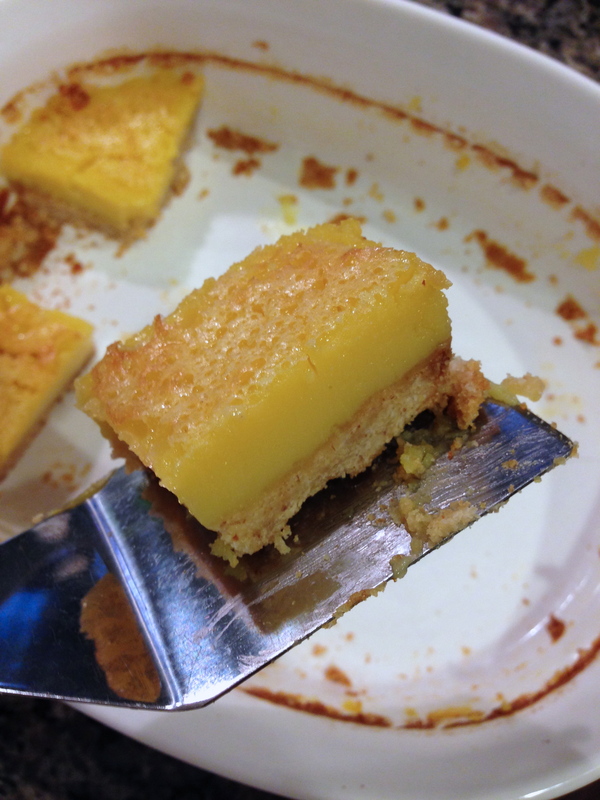 These yummy treats were made from the recipe on Paleo Cupboard’s website: Paleo Lemon Bars. This is the second recipe I have tried for paleo lemon bars. This recipe produces bars that hold their shape and are firmer, given that tapioca flour is used. However, I do prefer the taste of the lemon filling from the other recipe I have tried – I will share that recipe with you the next time I make them. 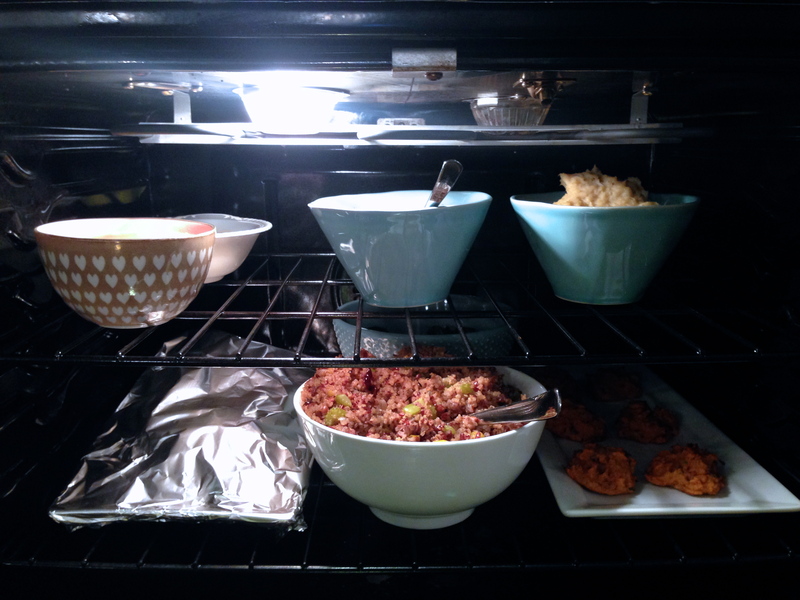 Maybe I could mix and match recipes… use this crust and the filling of the other recipe! Experimenting in the kitchen will happen!! Along with this food collection I have some home exercise routines you can do while your baby is awake and not stirring. The Baby Bjorn is a fabulous accessory! Place baby in this pouch and begin… squats, lunges, squat walks, heel raises, tree pose ya-da-ya-da-ya. Followed by a casual stroll, you and your baby will be happy as clams.